Dominique Wessel is a loving mother to three amazing boys. In 2003, her youngest son Ben became sick with Juvenile Dermatomyositis (JDM) soon after his third birthday. JDM is a rare, life-threatening autoimmune disease in which the body’s immune system rejects its own tissue, muscle, skin, GI lining and blood vessels. Ben’s immune system began attacking his body tissue to get rid of them because it didn’t identify the tissue as being part of his body. Ben has been in a battle for his life since then. I explained what was going on with Ben and Rich was happy and eager to work with him. Rich was great therapy for me and Ben. He understood what Ben was facing and moved with conviction step-by-step with Ben. It was a long, slow battle for Ben but he could feel Rich’s confidence that he would succeed and get stronger. They were “poetry in motion” and it brought tears to my eyes to witness! Rich took care of Ben like he was the only person in the world. Ben had his full attention. Rich’s enthusiasm and sincere, thoughtful approach fed Ben in every way, not just physically. They worked together on Ben’s goals, first to be able to hold his head up. Then they worked on sitting by himself, then standing and later to running around the clinic perimeter. 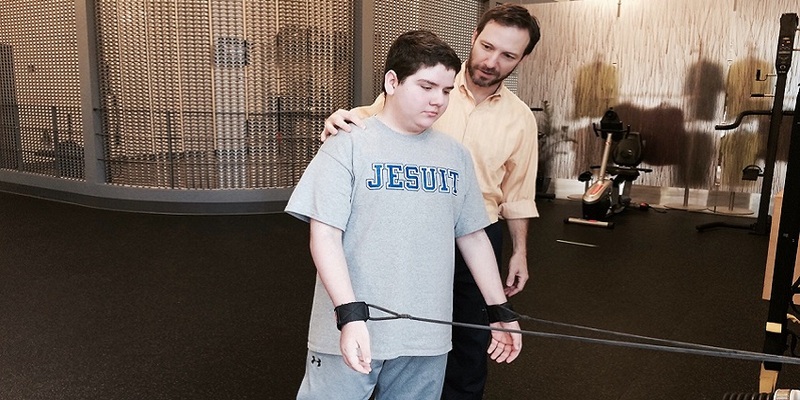 Ben was even able to move his limbs with heavy resistance bands. Rich worked his whole body. They worked with Ben for a very long time. The entire staff was wonderful. Ben is a very calm and humble person. He feels God’s presence every minute of every day. What is so crushing and painful for his dad and me to watch, he faces with such grace and humor. He and his brothers are best friends and they love spending time together. We believe in Ben’s dreams and goals. He is our hero! He is starting his senior year at Jesuit High School in August and we are very excited for him! He aspires to go to college and become a radiologist. God lead the way! God bless Ben and God bless Rich and Baudry Therapy Center! I don’t know what we would have done without you. Ben is OUR hero and it has been such a blessing to work with him. Thank you Dominique for sharing this beautifully inspiring story and for letting us be a small part of Ben’s journey.